I've been on a search for quick projects lately. It started with organizing my fabric stash and realizing it got out of control - not only was my craft room closet overflowing, but I was storing fabric in a spare dresser in another room and under the bed. It was so bad, that I was "discovering" fabric I didn't know I had. Has that happened to you before? I needed to assess my sewing habits and priorities before my fabric collection would have to move to a warehouse. Some of this fabric I bought without any projects in mind, other may may have been different than what I expected when it arrived and in some cases even though I had specific projects in mind, I never got around to them. The thing is that majority of my favorite garments were not ad hoc things I pulled together, but projects where I bought fabric for that specific purpose and made it up while the concept was fresh in my mind. "Fresh" being the key here because I found that even if I wrote down the plan, if I waited too long to sew something up then likely my taste changed, passion wore off or I simply lost the fabric in my Bermuda triangle stash. That's not to say I don't like how unplanned projects turn out, but the ones where I thought about it for a while and was able to realize the vision, turned out on average to be more memorable. With that, I decided to shrink my stash roughly in half moving forward. This will still leave me with options when I just want to make something on a whim, but leaves space to buy new fabric when I want to make something specific. Anyway, a (very) long story short is that this cardigan was one of the first stash busting projects. I grabbed the fabric out of my stash and used it to guide me to a suitable pattern. The fabric is a boucle that I got at FabricMart. Boucle texture is a bit thick and non-uniform so I wanted a very simple pattern without a lot of detail. That way the fabric detail could stand out and it would be easy to construct on a serger. At the same time, the fabric was little sheer - mainly white with small black speckles and too scratchy to wear it next to bear skin. This all lead me to zero in on a loose cardigan instead of a sweater. I had this McCalls M6802 pattern for a while, but never sewed it up. The picture on the pattern bore a resemblance to my fabric and I was relieved to not have to use my imagination this time to figure out if this silhouette would work out. I made a minor hack to the pattern because I liked the collar variation the most on view C, but lengthened it to look more like view D.
Sewing was super quick and easy since it's just a few pieces and there's not much to fit. The only issues I had were that I didn't have enough fabric for continuous collar/binding and had to sew it from 2 pieces and the sleeves. You can see the line in the pictures about 1/3 way up from the bottom. I may just be fixating on it because I know it's there. On the other hand, the sleeves seemed to be an issue for most people using this pattern. I read a few reviews ahead of time where people thought the sleeves to be too wide. Against my better judgement I decided to make the pattern up as is the first time anyway. Since my fabric was very thick, I thought that may look good. Surprise, surprise, I don't love the way it turned out. It's not necessarily the width along the arm, but how it falls next to the body. I think the arm opening is just too low and it results in unflattering folds next to bust area. Maybe if the fabric was very lightweight, then it wouldn't be as pronounced. 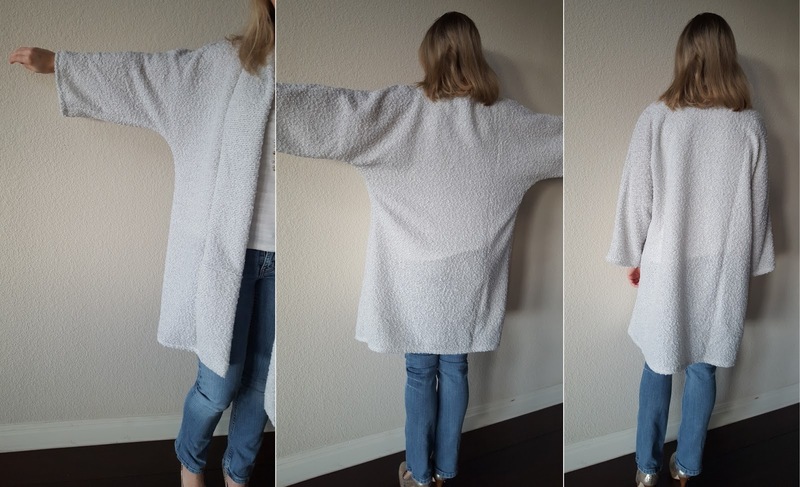 The other problem is that the pattern is drafted for mid sleeve, but I wanted the cardigan for warmth and therefore extended the pattern. I intended to make them full length, but must've mis-measured because they ended up just a tad short. Still wearable, but looks a little strange when the rest of the cardigan is so oversized. 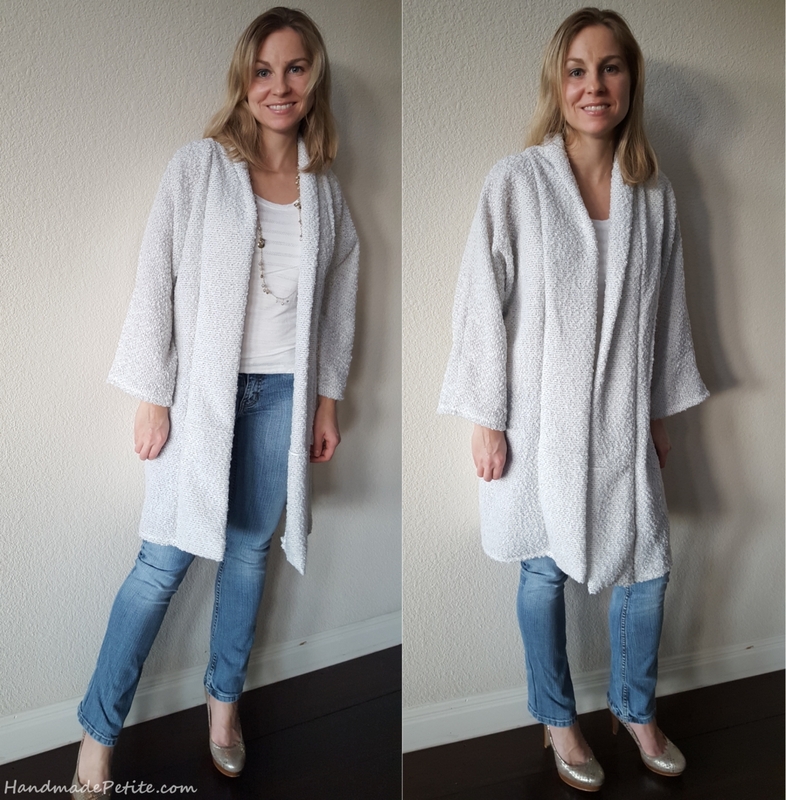 All in all I think the cardigan is wearable for layering in the office or lounging around, but I doubt it's a piece I'll be reaching for over and over. 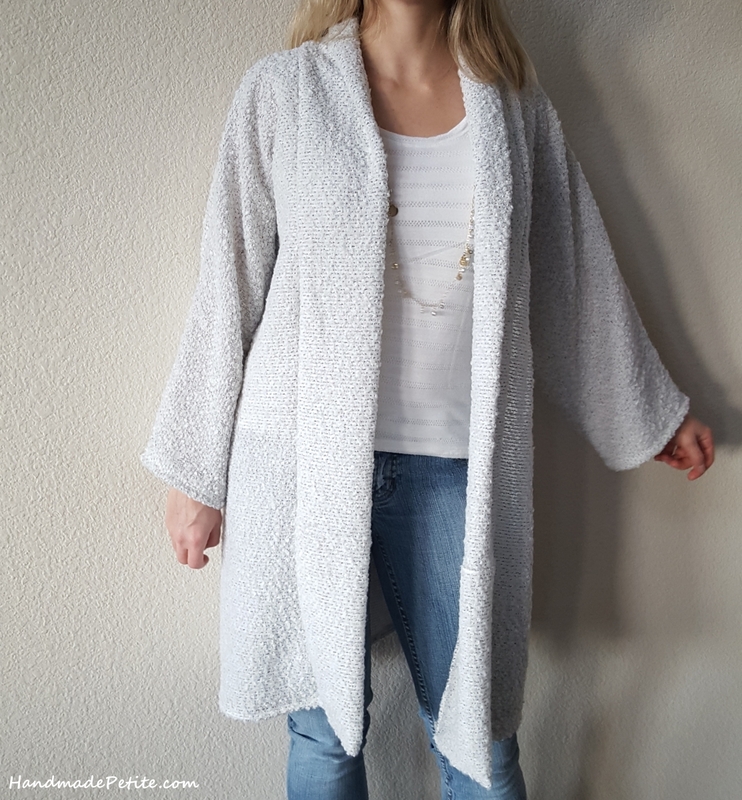 Just the combination of the oversized pattern and thick, rough texture of the fabric (maybe it would have been better suited for home dec project), makes it look a bit more like a bath robe than a cardigan/coat in the pictures. If I make this pattern again, I will use thinner fabric and raise the sleeve opening a little. Forgot to mention that the tank I have underneath is also me-made. It's nothing special so it didn't seem worthy of a dedicated post, but it's versatile and I wear it pretty often. The fabric has eyelet lines running through it so it was a bit sheer, but I sewed it with 2 layers to basically self line it and that worked well. On the pictures it looks like there are crease marks, but it just needed some ironing and I didn't notice it until after I took the pictures. I love that fabric! I made this pattern as well, and the sleeves were short on me too. I made the hooded version, but think this version is cute too. I'm on a stash busting mission these days too .Mine has become overwhelming! I love this fabric. It looks so warm and cozy. I need a cardigan like this! Beautifully done.